Cecil's son Xanda outside of Little Makalolo Camp in Hwange Game Reserve. The son of Cecil the lion - Zimbabwe's beloved big cat, whose death at the hands of an American trophy hunter triggered widespread outrage two summers ago - has been killed as well, according to officials at Hwange National Park. 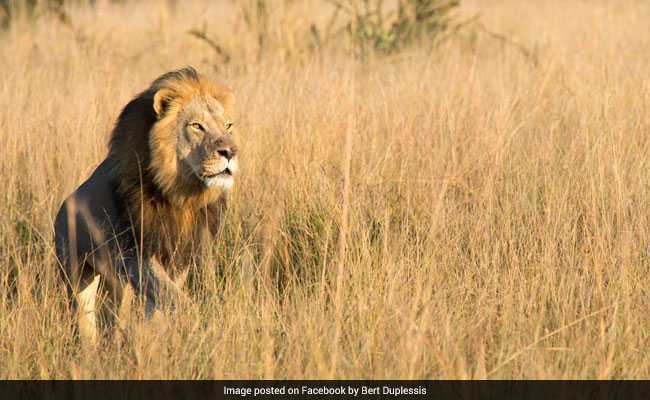 "We can't believe that now, 2 years since Cecil was killed, that his oldest Cub Xanda has met the same fate," the Facebook group Lions of Hwange National Park said Thursday. "When will the Lions of Hwange National Park be left to live out their years as wild born free lions should?" Cecil was one of hundreds of Hwange National Park lions whose lives have been meticulously monitored by Oxford University's Wildlife Conservation Research Unit. His movements had been followed in "minute detail" from 2008 until his death in 2015, biologist David Macdonald wrote on the unit's website. What made Cecil's death generate global outrage, the researchers later said, was a combination of unusual factors, including his dark and majestic mane, his English nickname and the dubious circumstances of his killing at the hands of a white, wealthy American. They said they hoped the attention would lead to improved conservation science - including the purchase of additional satellite collars. Xanda, Cecil's son, had been wearing one of those collars since October, the Telegraph reported. One of the lion researchers, Andrew Loveridge, told the paper that Xanda's pride had in recent months been spending time outside the park, where hunting is not illegal. "Richard Cooke is one of the 'good' guys," Loveridge told the Telegraph. "He is ethical and he returned the collar and communicated what happened. His hunt was legal and Xanda was over 6 years old so it is all within the stipulated regulations." Palmer later apologized, saying he thought the hunt was legal. He was not charged with a crime because authorities said he had gone through the proper channels. However, his hunting guide, Theo Bronkhorst, and a local property owner, Honest Ndlovu, were charged in the hunt. The charges against Bronkhorst were later dropped; it's unclear where Ndlovu's case stands. After Palmer was identified as Cecil's killer, he said his life was threatened. He temporarily shut down his dental practice, River Bluff Dental, where protesters created memorials, leaving stuffed lions to represent the one he'd killed.